A time lapse is defined by the Hallworth Village "where a camera takes a sequence of images of a subject with an interval of time between each image. The interval can be anything from less than a second to a day or more. When the images are played back the interval of time is speeded up creating shorter time". Essentially a time lapse is a number of different still images that each make a frame and then when these are put together using a variety of techniques they create a video which creates the illusion of something being speed up. This technique is incredibly effective when trying to demonstrate something such as a day change in a TV show, or as me and some other people in my group have used it to help demonstrate moving though time. (Are use of a time lapse in previous work) The technique what we used on the above video was simply to speed up some of the footage which we had collected. We have however been shown another simpler way to create a time lapse which uses command line coding to stitch a number of images together to create a time lapse. 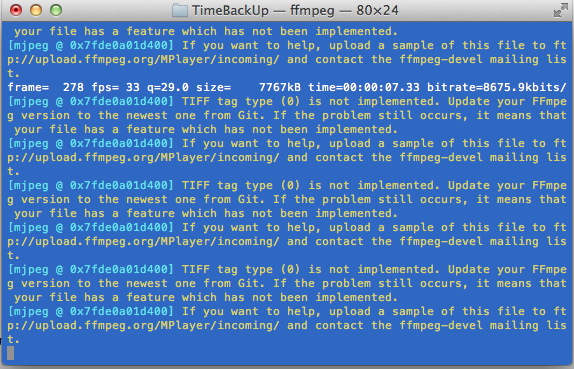 To do this we used ffmpeg which is a free to download and to be used with command line coding. This is technique which I am planning on using again, as I feel that the effect is an incredibly effective way of displaying an environment and movement within that environment.